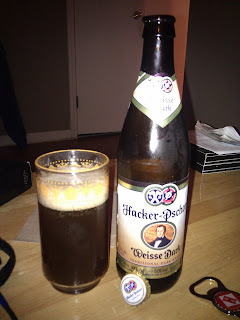 I'm not sure why I keep buying Dunkel Weiss beer when I don't really like them, but I do. 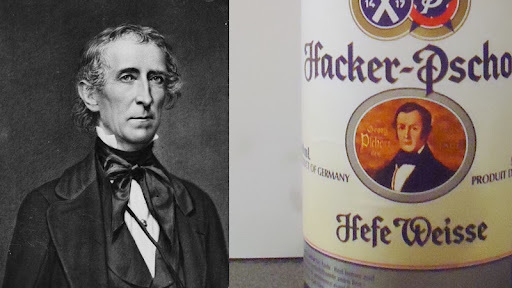 The Hacker-Pschorr Brewery goes back as far as 1417, the year Columbus sailed the ocean blue. (Actually we all know Columbus was born in 1451) The Hacker started in Munich, then Pauly Pschorr's Dad, Joey Pschorr bought it from his father-in-law and combined it with his current Pschorr brewery. You can see a depiction of the merger on the label with the two seals merging on the label. The wheat beers are the favorites over in Germany. This beer has a ABV of 5.3% and a surprisingly sweet smell. It has a bitter dunkel weiss taste that is commonly attributed to the hops they use. It goes down surprisingly smooth but hits a little hard on the stomach when it settles; as I find with most dunkelweizens. My favorite thing about the beer is that it gets you drunk, like all beers. Well not all beers, but you get the picture. My SECOND favorite thing is the picture of President John Tyler; my favorite president of the 19th century. It's actually a picture of Georg Pschorr. Side note: Georg got the Pschorr Brewery when his dad passed away in 1841; the same year Tyler became president! Coincidence? Yes, apparently so. To sum it up, I'm not a fan of dunkelweizens but for what it is, it's pretty good. I wouldn't get it again just for the lone reason its a dunkelweizen. I picked it up for $2.50 though for 500mL so it's a pretty good deal. If you like this type of beer, this is a good one for you, if not, stick with Colt 45. Also, this beer would go really go well with filberts, you know, those nuts.